Your answers has been submitted. We will get in touch with you as soon as possible. Please answer all the questions ! 5. Nicotine is an extremely addictive drug found in tobacco. 1. The nursing assistant should do all the daily care for the resident. 5. If the nursing assistant is too busy to wait for the resident to do his or her own self care, the nursing asstant should do all of the self care himself. 2. A person with Arterioscleorsis cannot har, but can understand. 3. Residents with Alzheimer's disease are not cognitively impaired. 4. Aphasia is when a pereson loses the ability to speak. 1. Caring for an incontinent resident takes up a small fraction of a nurse assistant's time. 2. Who coordinates a bowel and/or bladder management program? 3. When a resident is considered chronically incontinent, that means that he or she is always grouchy. 4. The resident can do everything related to the bowel/bladder training program without any outside help. 5. For the nursing assistant, the most important aspect of the bowel/bladder training programs is _ o n _ _ s _ e _ _ y. 6. Occasionally, residents will intentionally soil themselves. 7. How long should a resident be given to eliminate? 9. It is acceptable to refer to protective undergarments as diapers. 1. What is plaque as it pertains to dental care? 4. Dentures only need to be cleaned every few days. 6. Calculus is another word for T______T__R, which collects on teeth and dentures when not cleaned properly. 1. An infection control program is important for preventing the spread of infections, but is not required by the Federal Government. 2. Germs can be seen and felt on your skin. 3. Infections can be spread by blood, food, water, drugs. 4. When washing your hands, it is best to use cold water. 5. It is not proper to turn off the faucet with your bare hands. 6. If protective gloves are worn, you still nees to wash your hands before and after treatment. 7. The best way to prevent infections is to wash your hands. 8. A weakend immune system will protect an elderly resident from getting serious infections. 9. There is no need to tell your supervisor if blood from a resident's sheet gets into a small cut on your hand. 11. You can get AIDS or Hepatits B if contaminated blood or body fluids get into your blood stream. 1. The Federal _________ requires facilities to maintain resident privacy. 2. The person who investigates public complaints in a nursing home is the _________. 3. During a physical _________ of a resident, student nurses may not observe unless prior approval has been given by the resident. 4. Residents hava _________ to personal privacy. 5. Nursing assistants should maintain privacy while giving _________ care to a resident. 6. Residents shoul receive their _________ prompty. 7. Information found in the resident's medical _________ is considered confidential. 1. Residents should receive mail _________. 2. Residents have the right to make private _________ calls. 3. Residents may organize resident council _________, according to the Federal government. 4. Nursing assistants must be sensitive to personal _________ while bathing a resident. 5. _________ have the right to visit with family or friends in private. 1. While dessing a resident, your should maintain a private environment by pulling the curtain around the bed. 2. Mr. Jones calls his daughter once a day. The facility must provide a place for Mr. Jones to make his telephone calls. 4. It is polite if a student nurse or trainee asks the resident for permission to observe the care or medical treatment, but it is not required. 5. The facility must allow residents to meet in private with their guests, families, or other residents in the facility. 6. The local ombudsman is a person who helps residents exercise their rights. 7. Residents may arrange Resident Council Meetings, as long as one staff member is present. 1. If Mrs. Smith has Alzheimer's disease and has been named incompetent by a judge, who may authorize the release of medical information to Mrs. Smith's close friend who is a physician? 3. Violations of confidentiality cannot be punished in a court of law. 5. A nursing assistant may discuss a resident's status with another assistant in the break room, as long as there are not any residents around. 6. Confidentiality ensures a resident's privacy. 7. Ther family can always obtain medical information about the resident. 9. If one of your friends used to care for Mrs. Smith and now Mrs. Smith lives in the facility, you may discuss her condition with your friend, as long as she does not repeat the information. 1. The subcutaneous layer is a layer of fat that helps insulate the body. 4. Dehydration is not considered important when observing a resident for decubitus ulcers. 5. 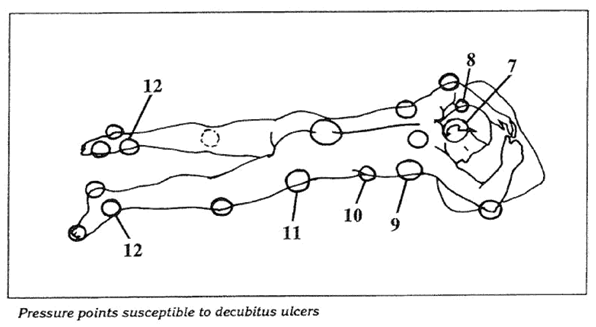 The most important medecine for decubitus ulcers is _ _ E _ _ N _ I _ N.
Identify the unlabeled prominent areas. There is only one correct answer for each label. 1. If you observe a significant change in a resident's condition, you should tell your supervisor immediately. 4. The MDS is a tool for assesing a resident's complete health status. 9. The resident should not be invited to participate when developing the plan of care. 10. As a nursing assistan, it is your responsibility to use your observation and assessment skills while caring for a resident. 1. Medication does not affect the appetite. 2. It does not matter if the food looks bad because most residents cannot see it. 5. You should allow at least 30 seconds between bites when feeding a resident. 7. You should give the resident full-spoon-bites. 8. You should alternate between different foods, and between food and liquid. 1. A physical restraint is anything that restricts a resident's freedom of movement, that the resident cannot easily remove. 7. It is acceptable to restrain a resident if he/she interferes with your work. 8. When a resident makes you angry, you should never place him/her in restraints. 13. The best way to prevent residents from falling is to place them in restraints. 2. If you are the first person to find a fire, you should immediately remove any resident that is at risk. 4. If you discover a gas leak, you should try to shut the gas off and fix the problem. 5. After an explosion, you should run outside and away from the building. 8. A weather warning reports the potential for a natural disaster to develop, and a weather watch reports that bad weather is incoming. 1. Behavior is caused only by personal experience and stress. "Give the resident's a lot of attention and be very open and friendly. Encourage him/her to participate in the facility's activities." 8. As a nursing assistant, it is your responsibility to be courteous and respectful when caring for your residents. 12. Sexually harassing a resident is punishable in a court of law. 13. Intentionally scaring a resident is not against the law. 1. Written communications of the facilites should be considered operating legal documents. 3. If there is room to write on the last line, then you should not initial/sign there. 6. When charting information, you should always use the term 'resident'. 7. Why should you discuss the contents of a resident's chart only with someone who has a need to know? 8. Observation in not only seeing the resident, but also relying on all of your senses. 3. The Federal government provides money to nursing homes, whether they are certified or not. 4. Who develops nursing home regulations? 5. How often are complaint investigations conducted? 9. If the survey team asks you a question, you should ignore the surveyor because you have work to do. 10. It is important to periodically review the facility's policies and procedures. 1. Communicable disease are transmitted only through blood and other body fluids. 2. A protective gown may be worn more than once. 3. If protective gloves are worn, you still need to wash your hands before and after treatment. 4. It is best to step into the hall when taking off a contaminated protective gown. 5. If a resident has a respiratory infection and is in isolation, you only need to wear a protective gown and gloves. 6. A resident may be put into isolation if he/she has an infection of any kind. 8. When discarding a contaminated protective gown, it should be placed in a regular waste container inside the isolation room. 9. If a resident is in respiratory isolation, he/she may still take a short walk down the hall. 2. What is the universal distress signal for choking? 5. You should not pull upward when administering the heimlich Maneuver. 8. When assisting a resident with breathing, you should administer one breath every five seconds. 9. If you see an object in the mouth of an unconscious resident that you believe has obstructed the air passageway, you should attempt to remove it. 1. The term psychosocial refers to the social, emotional, and physical aspects of relating with other people. 4. Reality orientation is a technique used to welcome residents into the nursing home. 6. During the day, it is best if the light in the resident's room is dim so that he/she feels tired and sleeps. 1. Every form of communication has three separate elements. Which of the following is not one of these elements? 2. There are two forms of communication, verbal and non-verbal. 3. If our verbal message does not match what we are saying non-verbally, we are sending a harmonious message. 1. One way to accomodate resident's needs is to check __________ residents regularly. 2. As a nursing assistant, each day __________ with your residents. 3. ___________ of need is the facility requirement to adapt its physical environment and staff behaviors to assist in maintaining resident's functional independence, dignity, and well-being. 4. The ___________ Coordinator is the staff member responsible for planning and leading activities for residents. 5. As a nursing assistant, you should always __________ your residents. 6. Abraham __________ developed the 5-stage hierarchy of needs. 7. __________ therapy is an activity that reduces tension and stress. 1. Positive __________ is when you notice and make positive comments about a person's desired behavior. 2. Everyone has physical, psychological, and __________ needs. 3. Listening to ___________ groups is a common recreational activity in most nursing homes. 4. Residents have the right to __________ the activities in which they want to participate. 5. It is important for you to check the activity ___________ everyday as you come to work. 6. When a resident wins, he/she yells out this word: __________. 7. In order to promote and encourage residents to participate in the activities program, you should reduce __________ noises. 1. Our posture is affected by every movement we make. 2. Proper alignment has been achieved when what four body parts are in alignment? 3. A resident should be re-positioned every four to six hours. 5. For good body alignment, knees should be locked or as stiff as possible. 6. You should always wash your hands when providing resident care , even if you are only re-positioning the resident. 7. The use of hand rolls or rolled wash clothes helps to avoid __________ ? 9. When positioning the resident, it is alright to cross their legs to keep air circulation to a minimum in the perineal area. 11. When repositioning a resident, you don't need to worry about shearing, or tearing of the skin. 2. Although a professional who is trained in caring for stroke victims will care for the resident during and immediately after a stroke, the person's recovery success will depend upon the care provided by the nursing assistant. 3. Symptoms of a stroke include. 4. E _ c _ _ ra _ _ _ _ n _ is the best medicine you, as a CNA can provide a resident that has suffered from a stroke. 5. It is appropriate and appreciated when you refer to a stroke victim's paralyzed side as "the bad side" or "the weak side"
6. Residents suffering from strokes rarely require a rotation schedule as a result of being bedridden. 8. What side of the brain affects the ability to speak? 9. An example of an "automatic answer" would be 'yes' or 'no'. 10. Profanity is never an 'automatic' response. 11. Residents suffering from a stroke rarely forget or ignore parts of their body. 6. There is no known cause of diabetes. 2. An accident is an unexpected, but intended event that causes injury to a resident. 5. It is best to keep the resident's glass and pitcher of water out of the resident's reach so he/she doesn't spill it. 7. To prevent spreading an infection, you should wash your hands and wear protective gloves. 10. It is acceptable to have a small chair under the fire extinguisher, as long as it can be moved easily in case of a fire. 1. When a resident is first admitted, a Personal Property Admission Inventory Form should be completed which should be maintained on an ongoing basis. 2. The inventory form does not require revision if someone is simply exchanging articles of clothing. 3.What would be a good guide to identify the owner of articles that are not well marked? 4. All articles should be marked with the same information, e.g., full name or social security number. 5. You should not mark resident's personal belongings with a room number. 7. When charging the bedding, you should check it carefully before rolling soiled sheets into a bundle. 9. Police reports are not necessary for missing items in a facility of this nature. 2. An incident report is generally the same as an accident report. 4. If one resident hits another resident, you do not need to complete an incident report. 5. It is important to listen to the resident who fell out of bed, but not necessary to investigate any further. 6. If an employee cuts her finger with a sharp object, an incident report should be completed immediately. 7. An incident report should only be filled out for residents. 8. It is helpful but not necessary to list witnesses on the incedent report. 10. It is suggested but not required that you sign the incident report. 12. Incident reports are usually kept in the resident's medical record.